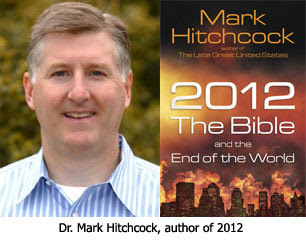 Does the Bible say anything about the world ending in 2012? Dr. Hitchcock: The Bible doesn't have anything to say about 2012, and I think that is very important, or about any specific end times date. In fact, when people set dates like this, they are not reading the Bible. In the Book of Revelation there are no dates set in it. Jesus said we are not to set dates. He even said in Matthew 24:35-36, "Heaven and earth will pass away, but my words will never pass away. No one knows about that day or hour, not even the angels in heaven, nor the Son, but only the Father." Clearly Jesus during His incarnation didn't even know. History is littered with date setters, and they have always been wrong. When someone sets a date for the Second Coming of Jesus or the end of the world, you can be sure that's not the day it's going to happen. Remember right before Jesus went to Heaven His disciples had asked Him in Acts 1:6-7, "Lord, are you at this time going to restore the kingdom to Israel?" He answered them, "It is not for you to know the times or dates the Father has set by his own authority." So, not only are we not to look at 2012, the Bible actually forbids setting dates for the Second Coming of Christ and for the end of the world. Even when Jesus Christ returns to this Earth the world does not come to an end. It's going to be renovated before entering into the Messianic Kingdom, which is the Millennial Reign of Christ. There is going to be a tremendous renovation of the Earth. It is going to be paradise regained. And, then again, when we get to the end of that 1,000 years, Revelation 21:1 says, "Then I saw a new heaven and a new earth, for the first heaven and the first earth had passed away, and there was no longer any sea." I think God is going to take it all apart and put it all back together again. So, technically, if someone says, "When's the world going to end?" we can reply, "At least 1,007 years from now." In effect, the Earth will never end; it will go on forever and ever. There is going to be a new Heaven and a new Earth that God is going to make, a glorious one, one that has been returned to its original perfection. The population is going to dwell the Bible says in righteousness and in perfection. I can hardly wait for that day to come! speaking of date-setting many scolars believe the rapture will likely occur on a feast day(namely rosh hoshanna, feast of trumpets) i think that`s a form of date setting is it not? i can hardly wait myself. Yes, I think it is hartdawg. Even though I think the feasts to point to prophetic events, there's nothing that says it has to happen on that day. Although, I have to admit, I do get excited on Rosh Hoshanna. I've heard some pastors (like John Hagee) try to get around Matthew 24:36 by saying something to the effect of- the bible says that no one knows the day or the hour, but it never says that we can't know the year! By focusing on what the passage does not say, this viewpoint does seem to be getting away from the true spirit of the passage. Or perhaps just taking it a bit too literally? Anyway, just wondered if anyone else had heard anyone say something like this. What about 1 Thessalonians 5:4 ...we key in on the not knowing so much that we forget he also said this. (vs 4) He doesnt say we will know the day, but he says we will not be surprised like the thief either, so we should know He is at the door even now. 4But you, brothers, are not in darkness so that this day should surprise you like a thief. 5You are all sons of the light and sons of the day. We do not belong to the night or to the darkness. C in Salem- you raise a GOOD point. I've heard others "expand" on the day and hour thing. To my mind, that just adds credence to this whole 2012 thing. We won't surprised because we're watching and waiting for Jesus. It's like the whole thief analogy: you won't be surprised by one if your expecting one. 'The day or the hour' cannot be known. Depending upon the context, it can mean 24 hours or various extended times. eg. each day created in Genesis was a literal 24 hours, yet the entire week of creation is also called 'the day’ (Genesis 2:4). Yes, we will know the season by the revealed signs, which could be short or long, but no specifics. It helps to recognise the differences between The day of the Lord – kyrios, which is always of darkness and wrath and The day of Christ – christos which is always blessing. The two run nearly parallel in time but are so obviously different from one another. It’s a great study to do and important as Posties insist they are the same (for them it is necessary). I'm an old-school literalist. God says what He means & means what He says! Since He didn't include week, month, or year in that statement I think they're fair game, so I've got no problem with Hagee or others on that. Literally Jesus said 'no one knows! as far as I am aware He didn't change that literal meaning did He? If not then it is adding to, or taking from, God's Word which is forbidden. It's like I said, if we can know the year -- and as far as I can remember, the only specific year given in the Bible is the year of the crucifixion as given to Daniel--, then that adds credence to false prophets like Nostradamus. If we can date ahead by just one day,or less, then imminency is destroyed. As Paul taught to expect Jesus and to watch for him, imminency for the Day of Christ to begin is a fact! We don't look for someone if we aren't expecting them to arrive. Maranatha! E.I., I think we're all "caught up together" in semantics! That "...that day and hour knoweth no..." [...being, other than God...] is absolutely affirmed by the Word! Then the operative portion is: "...knoweth NO..." [...being, other than God]. However, God has granted us, of His own image, with 'creative imaginations' & therefore 'speculation' beyond "day" and "hour"; Matt. 24:36, as such, is still simply, just 'speculation', and **NOT**, in any way, "adding to, or taking from, God's Word which is forbidden"!... as you say. Then we have NT 'Red Flags' going up! Even Jesus reassures us in vs 33: "So likewise ye, when ye shall see all these things, know that it is near, even at the doors." Did I sound argumentative about it? I am sorry if I sounded ‘bolshy’, I write as I speak and think out loud. It’s true what you say; I also feel ‘the day’ is so close; the signs are lining up to be noticed. Not like when I was young, it was years between them, and yes, my heart also burns with a sense of expectation, but being cautious is a part of my culture which I accept can put a dampener on things.